Straightforward geometries have become customary elements in today’s interiors, but they offer a lot of design opportunity. Our Hedron chandelier (CHA2185) is a great example — it combines a familiar look with the potential to pack a proverbial ‘design punch’. As experts at design and manufacturing, we’ve helped our clients extend this popular fixture style to solve a variety of design problems. 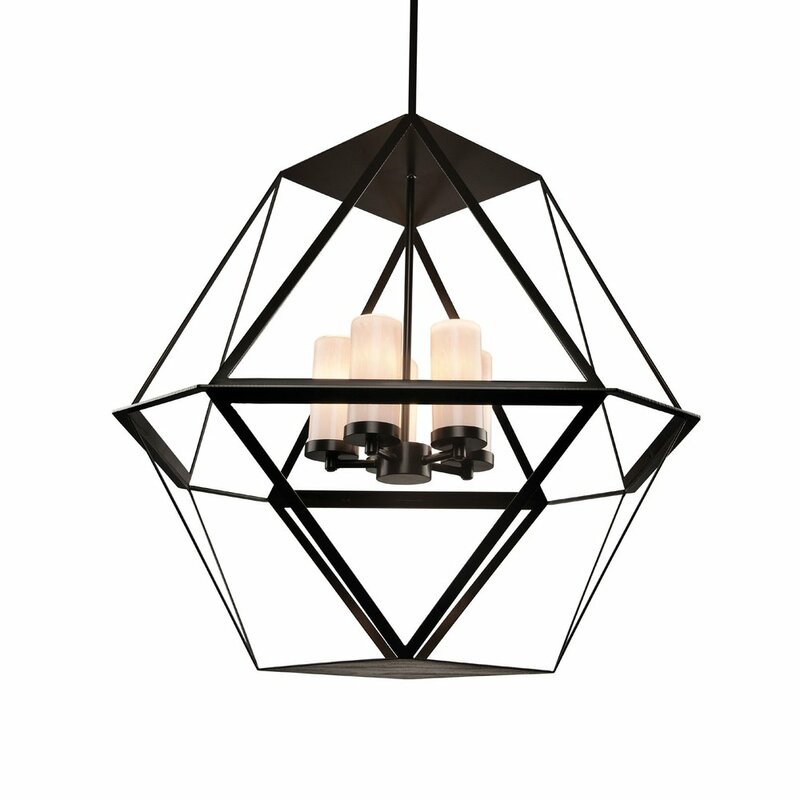 Above: The original 30”D Hedron chandelier (CHA2185), shown in a Matte Black finish. Below, a custom version scaled to more than twice the size of the original design. At 55” in both diameter and height, this airy oversized version fills a larger space without adding extra visual weight. Additional lamping accommodates the need for increased light output in a larger installation space. The two images below illustrate the broad versatility of this polyhedron design. An immediate suit for clean contemporary interiors, it’s also applicable for transitional, mountain rustic, farmhouse and coastal spaces. Beyond scale and lamping modifications, this fixture style can be easily adapted to additional functions. Shown below is a custom sconce (CU-CH2246-18A-F) conceived by our design team to accompany the Hedron chandelier in a commercial installation.